Keep track of all of your reference lists and bibliographies. Pitt's library resources work with citation management tools and allow you to import citations from sources like PITTCat+ and article databases. Mendeley manages your reference lists and serves as an academic social network. Organize your research, collaborate with others online, and discover the latest research. EndNote allows you to search online bibliographic databases, organize references and create and format instant bibliographies. It's integrated with Microsoft Word as well. Zotero is an application that collects, manages, and cites research sources. It's easy to use, connects with your web browser to download sources, and best of all it's free. Need help with formatting citations? Use this brief guide to five major styles. Correctly citing information is an essential skill for any academic researcher. Our Major Citation Styles guide provides links to several online style guides covering the basics of correctly citing your sources. It's often best to consult the official style guides when in doubt. Most ULS libraries will have copies of such popular citation style guides as the American Psychological Association, the Modern Language Association, or the Chicago Manual of Style. To access the table of contents of the Online Chicago Manual of Style, click on the Chicago Manual of Style in the upper left corner. The 8th edition is the most recent. This title is held in most ULS libraries; please check the link for your library. The 6th edition is the most recent. This title is held in most ULS libraries; please check the link for your library. For links to other brief online sources which guide you through correctly citing information see the link below or use the "Use the Libraries" tab, then select "Help Sheets and Tutorials." Under "User Guides" select "Citing Sources." Brandt, Loren, Debin Ma, and Thomas G. Rawski. 2014. "From Divergence to Convergence: Reevaluating the History behind China's Economic Boom." Journal Of Economic Literature 52, no. 1: 45-123. EconLit, EBSCOhost (accessed January 11, 2016). Platt, Rutherford H. "The Humane Megacity." Environment 51, no. 4 (September 2009): 46-59. Academic Search Premier, EBSCOhost (accessed February 7, 2014). Platt, Rutherford H. "The Humane Megacity." Environment 51.4 (2009): 46-59. Academic Search Premier. Web. 7 Feb. 2014. Platt, R. H. (2009). The Humane Megacity. Environment 51(4), 46-59. Please be aware that plagiarism is a major concern for the University community. Students' written work must be their own. When using ideas that are not your own in your writing, you must cite those ideas. Proper citations are a critical component of avoiding plagiarism, but there is more to watch out for. 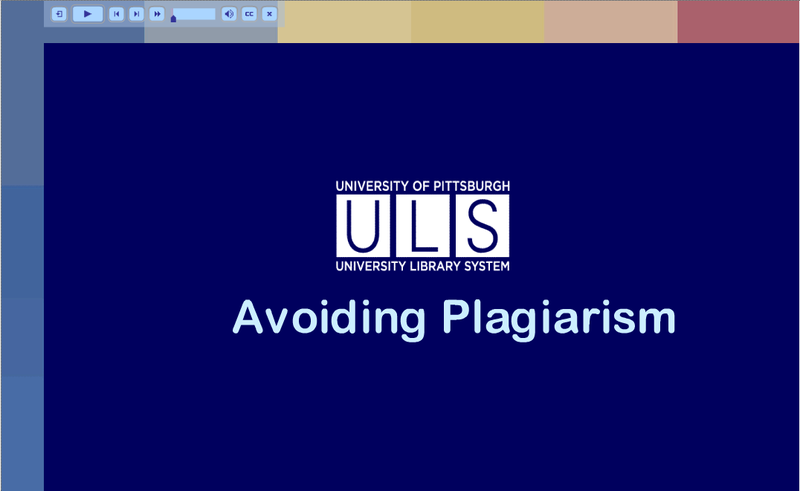 Have a look at the library's tutorial, "Avoiding Plagiarism," then please ask a librarian or a professor if you have any more questions about plagiarism. Organizing your research and putting your ideas down on paper can be difficult. You can get writing help at the Writing Center. Located at 317B O'Hara Student Center (OSC), 4024 O'Hara St. The OSC is across the street from Thaw Hall. You can schedule an appointment online or drop into their office at 317B O'Hara Student Center (OSC), 4024 O'Hara St., or Hillman Library. You can make an appointment or drop in during the operating hours at Hillman. Need someone to review your paper? Visit the Writing Center or Academic Success Center on your campus. Make an appointment online for one-on-one assistance in various locations, including Hillman Library. Visit the Learning Resources Center, located in the Millstein Library Building (ML 250) to have your writing reviewed. The Academic Success Center (ASC), located in room G-16 of Owen Library, provides drop-in hours for tutoring in writing. Visit the Learning Center in Haskell Memorial Library for writing help. Located in Hanley Library 250. To schedule an appointment online click TutorTrac on the writing center home page or drop in during open hours.